Magruder Companies | G&M Asphalt Company, Inc.
G & M Concrete Company was founded on May 2, 1973. 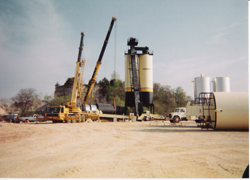 The company's prime objective was to deliver concrete that was made fresh on-site by use of mobile mixers. Mobile mixers were specialized trucks that contained compartments holding all the source materials for concrete. The final product was not mixed until the truck reached the job site. Eventually the mixers were outdated as new technology replaced this form of concrete business. G & M Concrete & Asphalt Company, Inc. was founded in September of 1983. The Magruder family decided to focus their efforts on asphalt. This was an excellent opportunity to incorporate overstock products from their limestone quarries and transform them into a high quality paving product. Originally, the plant was used to handle a few local jobs and occasionally a MODOT contracted job. As time passed, needs and expectations changed. 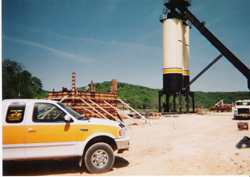 G & M Concrete & Asphalt Co., Inc. grew from a secondary business to a thriving investment. There have been many changes since the beginning. We have grown from a 200tph Cedar Rapids batch plant (1983) to a 450tph CMI drum plant (2000). This plant is capable of switching on the fly between mixes and has the capacity for storage of 660 tons of hot mix asphalt. G & M Concrete & Asphalt Co., Inc. continues to meet the demands of our customers by producing a wide variety of mixes ranging from commercial surfacing to SuperPave desiged and used on interstate highways. Our experience and education has made us a leader in the asphalt industry and we will continue to provide the highest quality product and level of customer satisfaction.